Fall in New York is the best – the weather is perfect for visiting farms to pick apples, pumpkins, go on hayrides, and get lost in a corn maze. New York’s Stoughton Farm is already vying for your visit early, with an awesome Super Mario Brothers-themed corn maze to please your inner gamer. 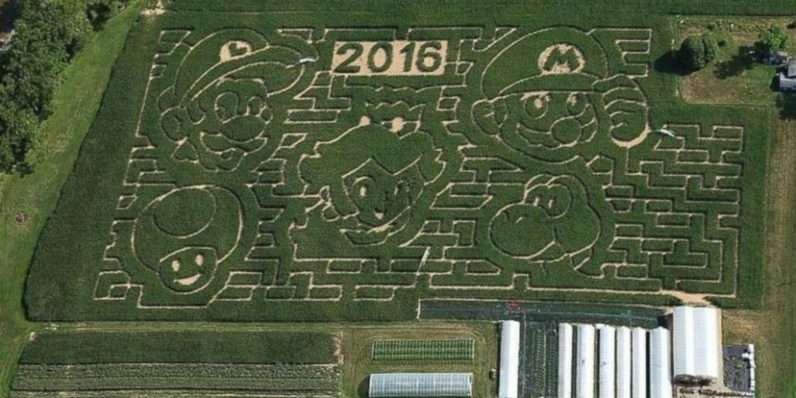 The farm, located in Newark Valley, New York has a new maze every year, and owner Tim Stoughton said he and his wife selected the iconic gaming duo for 2016 because they’re widely beloved and easily recognizable. The two hope that both kids and adults would enjoy the maze, which helps brings additional visitors to the farm and help keep it profitable. Previous maze themes at the farm include vampires, anti-bulling awareness, and renewable energy. Stoughton tells ABC News that the farm’s maze attracts about 10,000 visitors every year. The aerial shot of the farm was taken by a family friend who is a pilot, and was then shared to Reddit by a neighbor. The Stoughton Farm maze officially opens for visits on September 17 with an admission price of $9 per adult. Let’s-a-go!